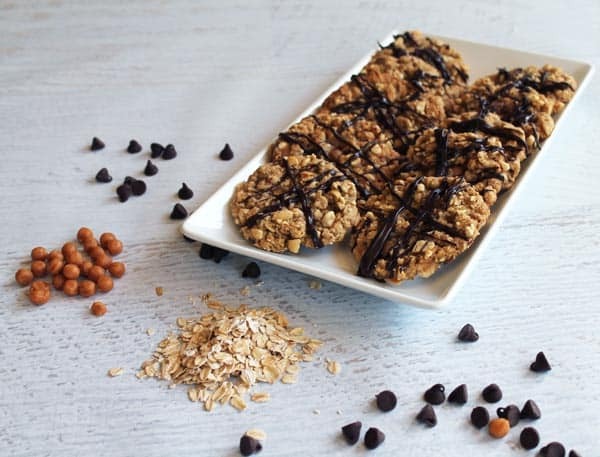 Whip up a batch of our Take 5 Oatmeal Cookies. 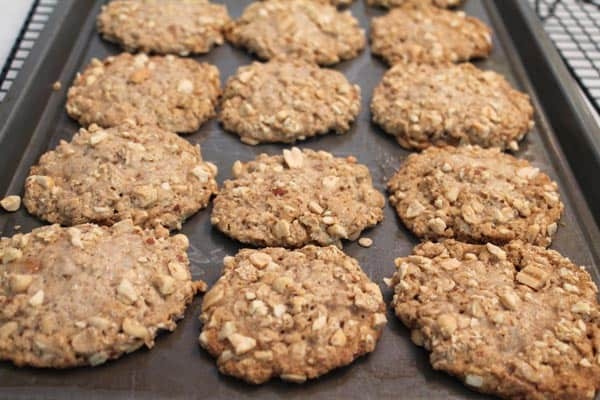 These sweet & salty oatmeal cookies are reminiscent of Take 5 candy bars. 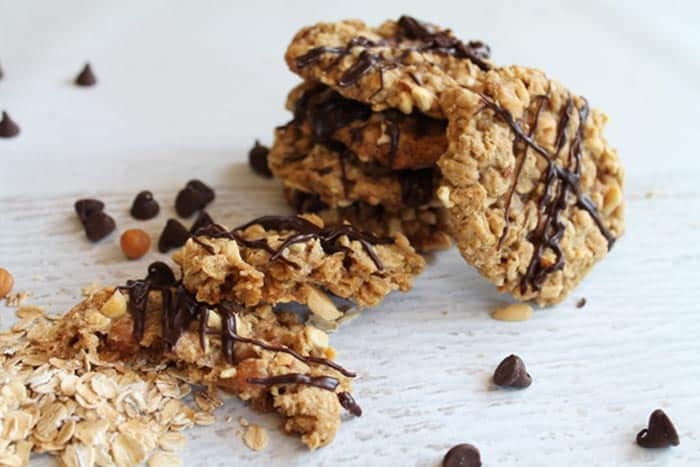 Lots of gooey caramel nestled inside chewy oatmeal cookies and coated with crunchy peanuts. And, of course, there’s a chocolate drizzle too! I am so excited! This is my first entry as part of The Creative Cookie Exchange. I have admired all the people that put out such delicious looking recipes for months now and finally decided to take the plunge and join in the fun! This month’s theme was caramel. You know, that gooey, thick and rich sweet taffy that is good by itself or in just about anything – as a brownie, crepe or ice cream topping, flavoring for coffee, cake, bars, trifles and of course COOKIES! So what did I come up with? Have you ever had a Take 5 candy bar? Let me tell you, they are really decadently delicious! It’s a crunchy chocolate bar that is chock full of caramel, peanuts and pretzels – sound good? So I went to work to incorporate all these great flavors in one cookie. 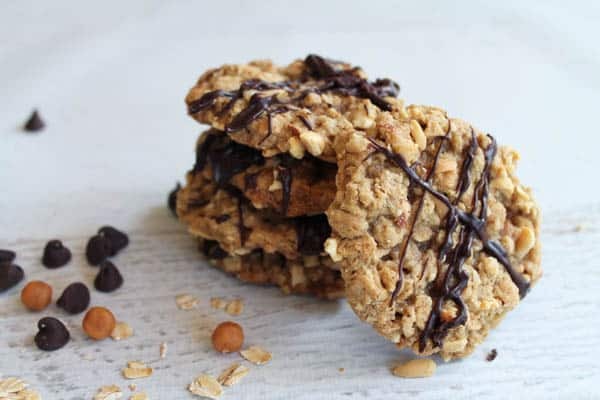 I cheated a little as I substituted the oats for the pretzels although you could add some pretzels to the crushed peanuts and coat the cookies with both flavors – not a bad idea to try out next time. I also found this great caramel product called Caramel Bits by Kraft and they’re so much easier to use than having to open, what seems like, hundreds of packages of individual caramels and cut them into pieces. I have used the bits for other recipes where I need to make a caramel sauce and they melt a lot faster than the larger individually-wrapped pieces. I sent half of the cookies into work with my husband and they were gone so fast he didn’t even get one for himself. Now if that isn’t a good endorsement I don’t know what is! Let me know if you try them. Would love to here from you. Hope you enjoy! 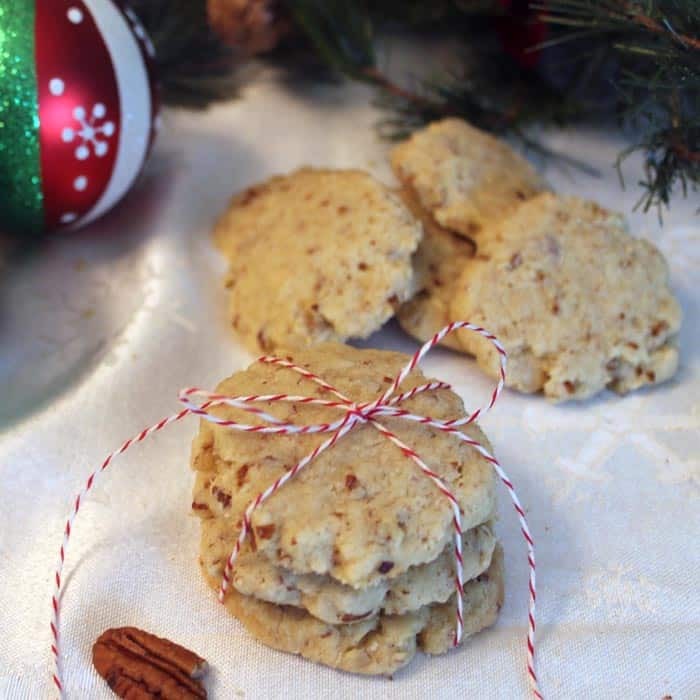 Whip up a batch of sweet & salty oatmeal cookies reminiscent of Take 5 candy bars. 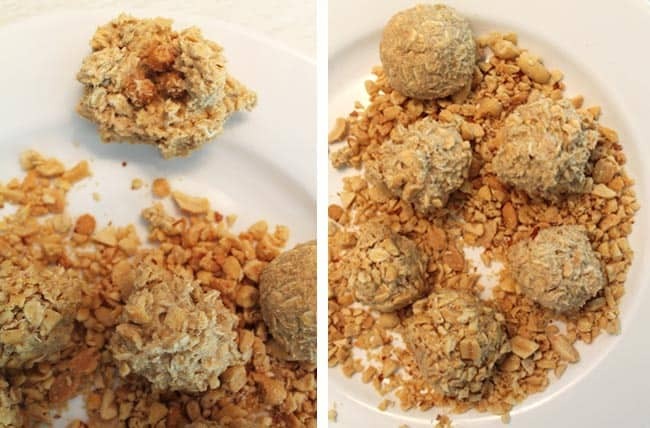 Lots of gooey caramel nestled inside oatmeal cookies coated with peanuts. Preheat oven to 350 degrees. Spray cookie sheets with a nonstick spray. In a large bowl, cream butter with sugars until light and fluffy. Add eggs and vanilla and continue to beat until well incorporated. In a second bowl, combine flour and next 4 ingredients. Add to creamed mixture. Stir in oats. Open caramel bits and place in a bowl. Crush peanuts (and combine with crushed pretzels if using) and place on large flat plate. Bake 12-14 minutes or until nicely browned. Remove and let cool on cookie sheets for several minutes before moving to wire rack to finish cooling. While cookies are cooling, place chocolate & cream in a microwave safe measuring cup and melt in microwave in 30 second increments until mostly melted. Stir until smooth. Place wire rack of cookies over clean cookie sheet and drizzle chocolate over cooled cookies. Let chocolate set before storing in airtight container. The theme this month is Caramel–any kind of caramel in any kind of cookie! If you are a blogger and want to join in the fun, contact Laura at thespicedlife AT gmail DOT com and she will get you added to our Facebook group, where we discuss our cookies and share links. Please be patient though, as this month Laura is off to Italy and will not be checking email quite as often! Pretzels in a cookie? Wow I should try this though will have to make pretzels first since they aren’t readily available here but by the look of these cookies, I’m aure all the hard work will be paid off. I LOVE Take 5 bars… miss them! Mix pretzels with peanuts on the outside of the cookie and you’ll think you’re taking a bite of one! I just discovered the caramel bits too and love them!! Your cookies looks delicious!! Welcome to the group!! I’ve never had a Take 5 candy bar but the combination sounds fabulous. I love salty with my sweet, especially when we are talking about caramel. Welcome to the group! Thanks Stacy! I always love salty and sweet candies so I had to try it in cookie form too. 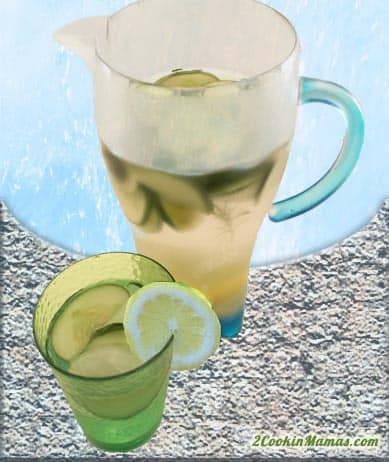 Hope you get a chance to try it. Perfect looking cookie, I will take 12 of those Take 5!! So glad you are baking with the group this month! I can see why these cookies disappeared quickly- they would at my house too! 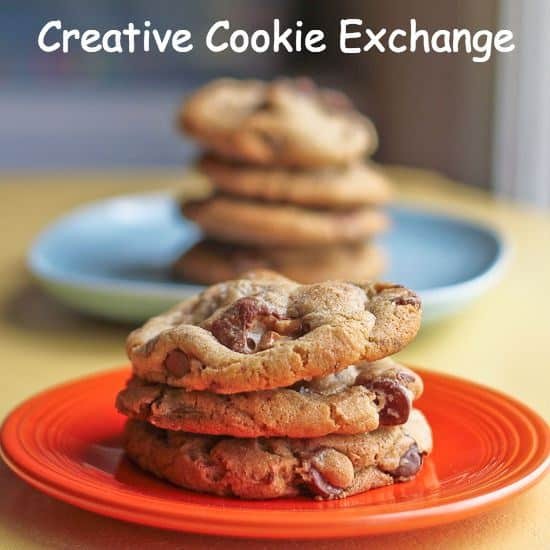 Welcome to the Creative Cookie Exchange! 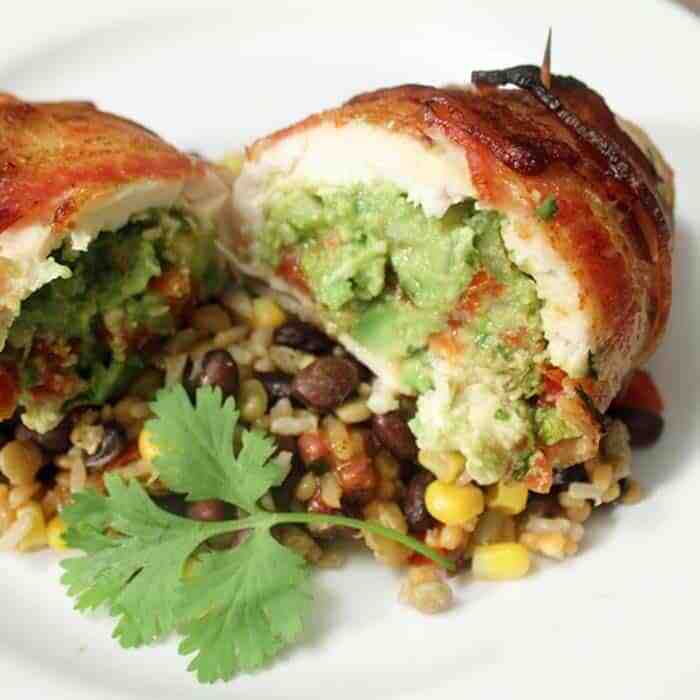 Thanks for sharing such a nice recipe too. Now you have me on the search for those caramel bits. Love being a part of this group! Can’t wait to see what comes next! I was pretty happy to find those caramel bits myself. It saves so much time whenever a recipe calls for caramel.